Whilst on leave from my post as a Wren telephonist on 23 March 1944, I received a telegram instructing me to go to Fort Southwick, Portsmouth for an interview for a mystery job. Although I was successful and was the given the job, I still had no idea what position was to be filled. On 1 April 1944, I duly reported to Southwick House in the small village of Southwick in Hampshire. The house was at the end of a long drive and on arrival I was directed to the cellar where a large telephone exchange was being constructed by two GPO engineers. I was soon to find out how important this place was when I started constructing a telephone directory. I found that General Eisenhower, General Bradley, General Montgomery, Admiral Ramsay, Rear Admiral Creasy and Air Chief Marshal Tedder all had telephones on the exchange. To keep the telephone exchange secret we answered calls using the codeword ‘SK’. Our postal address was Naval Party 1645 c/o BFMO Reading and no postage was required for mail but ‘On Active Service’ was written on the envelopes and all letters were censored. We were also allowed out only in a 10 mile area of Southwick House. When the Wren telephonists arrived we all did two weeks’ training at Fort Southwick, a Combined Ops Exchange, 150 steps underground in a series of tunnels. We had to practise using a VHF telephone that had one-way transmission. This came in useful when Winston Churchill visited the troops in France after D-Day and made a call to King George VI from this telephone on the beach. Then I had the task of explaining to the King’s secretary that he had to say ‘over to you’ before the other person could speak. As the Royal Navy is the senior service I was put in charge although the exchange was manned by an equal number of Wrens and Royal Corps of Signals men of 21st Army Group. I wrote out the Duty Roster and kept them in order. Telephonists were not allowed to take cups of tea on to the switchboard and there was no smoking permitted but they were allowed short breaks in an adjoining room. I had a desk at the back of the Exchange and had to make Visual Index Files for each of the16 positions on the Exchange. The telephonists worked 24 hours, 7 days a week and were divided into three watches to cover the day and night duties. I only worked days but Army corporals were in charge when I went off duty. There was a small 10+50 telephone exchange in the War Room so I had a War Room pass to visit and supervise my Wren manning this exchange. A Royal Marine with a rifle was on duty at the door to see that nobody else was allowed in except the top brass and the Wren plotters. In the War Room, as well as a wall map which had been made by Chad Valley, the jigsaw makers, there was a map of the coasts of Britain and France on a table where the plotters worked moving models of ships and aircraft and men as instructions came through their headphones. Unwittingly, the arrival of the naval officers caused me a headache when some of them didn’t like the rooms they were allocated and changed with other officers. This made my directories useless and I was allocated Sgt. Laver from the Royal Corps of Signals to help sort it out. He went to the various rooms and rang me to say who was on each extension. So an accurate directory could finally be made and visual index files for each operator brought up to date. We had been called to a meeting the day before D-Day when the weather was too bad to sail and Admiral Ramsay arranged a cricket match between the officers and Wrens. When one Wren had difficulty batting, he changed from bowling over-arm to underarm to give her more chance of hitting the ball. It reminded Rear Admiral Creasy of the Armada before which Drake played bowls on Plymouth Hoe. The weather was not ideal on 4/5 June 1944 but at the meeting in the War Room on the eve of D Day, the Met officers advised that it would be two more weeks if the invasion was cancelled before the tides and moon were right for the landings. So General Dwight Eisenhower famously said ‘let’s go’ and the invasion of France was on. I stayed on duty all night on the 5/6 June 1944. General Omar Bradley was the first to call to say they had a foothold on OMAHA beach. Unfortunately, as later became clear, this part of the coast was heavily defended and the Americans suffered heavy losses. When I went to breakfast in the Nissen hut, which was our mess, in the morning we waited for the BBC 9am news to make an announcement of the landings and a big cheer went up when the nation heard that we had a foothold in France. We had been part of it ! We went across to Arromanches in a destroyer, then in a 15cwt open backed truck across Normandy to Granville. We couldn’t sail down the west coast of Normandy as the Germans were still in the Channel Islands a few miles away. As the roads had been bombed by the Allies we arrived in a very dusty state and couldn’t wait to get washed. Until the main party arrived we lived in a French guesthouse and had meals with the American GIs in the casino which was great as their food was good. When we were told the main party would be arriving we had to move into an empty medieval village called Hauteville, which the Germans had vacated after D-Day. Unfortunately the main party didn’t arrive as there were U-boats in the English Channel and they were not allowed to sail. So we chose a three storey house in the village and barricaded ourselves in a top bedroom by placing our large kitbags against the door. We slept on the floor, fully dressed, with our gas masks for pillows and our duffle coats for blankets, and were very happy to see the main party arrive next day. We stayed in Granville until 12 September when we moved to La Celle St Cloud, just outside Paris, where we were billeted in two long wooden huts in the grounds of the Chateau. They were divided into cabins, a few individual and others holding five bunks. There was an ablution room at one end with a row of toilets and a row of washbasins with only cold water taps. Fortunately our Quarters PO, Wren Dorothy Harvey, was able to obtain a field kitchen copper, which we could fill with cold water and heat by lighting a fire underneath. There was plenty of wood in the grounds of the Chateau. We had a canvas bath fitted into a wooden frame and this we set up on the floor. It was very draughty with Wrens coming to wash or visit the toilets and no privacy so we didn’t bath very often. When the weather worsened and winter set in, we were snowbound and the journey by truck from La Celle St Cloud to the Chateau d’Hennement where we worked in offices became hazardous. On Christmas Day 1944 we made a fire in the mess in a wrought iron stove and broke up a chair to get it started, as the wood in the grounds was so wet. That was the worst Christmas I’ve ever had. On 1 January 1945 I was asked to report to Admiral Ramsay’s office where he informed me that my name was in the New Year’s Honours list. I had been awarded the British Empire Medal, Military Division, for zeal and wholehearted devotion to duty. Unfortunately, the next day, 2 January 1945, Admiral Ramsay was killed in an air crash. His plane crashed on take off as he was leaving with his staff officer (Operations) for a staff meeting in Brussels. Whether it skidded in the snow or the weight of the snow on the wings caused the crash was never divulged but we were all desperately sorry to lose such a popular admiral. We attended his funeral in the new cemetery at St Germain en Laye and were allowed to wear Wellington boots with our bell bottom trousers tucked in because of the snow. As the cemetery is opposite Chateau D’Hennement where we worked, we walked there behind the main party. General Eisenhower came in his jeep with his outriders on motor cycles wearing white helmets, white gauntlets and white gaiters. We called them the snowdrops. All the top people from the Army, Navy and RAF attended. By February the snow was so deep and the roads so frosty, the truck we were in almost skidded off the hill at Bougival into the river below. 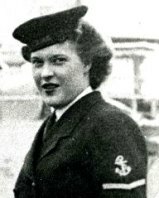 And we were eventually moved into a house in St Germain en Laye, where I shared a room with PO Dorothy Harvey, our Quarters Petty Officer, and we actually had a washbasin with hot and cold water on tap, such luxury. On 8 May1945 when VE Day was announced, we went into Paris to celebrate with the French people who crowded down the Champs Elysees. The excitement was immense. In June the advance party moved to Minden in Germany. We were supposed to fly, but when we arrived at Le Bourget airport the planes couldn’t take off because of fog. As our kit had already left by Royal Marine lorries, we had to return to base and share with the main party. It was either a canvas bed or a mattress on the floor. We left the next day by single decker bus driven by Royal Marines and were given 24 hour survival packs. Tea was in a cube with milk and sugar, just pour hot water on it. We had little methylated spirit stoves to heat the water by the side of the road when we stopped for a comfort break. Wrens went over the hedge one side of the road and Royal Marine drivers the opposite side. We stayed in an hotel in Brussels overnight then continued our journey to Minden the next day. We arrived in time for our evening meal which was spam, peas and potatoes, followed by tinned peaches. We were in the American zone which meant most of the food was in tins. However, our irons (knife, fork and spoon) were in our kitbags which hadn’t arrived so we had to eat peas and peaches with our fingers – very slippery. We were billeted in houses which were in an area commandeered by the army and surrounded by rolls of barbed wire, with a Royal Marine sentry on duty at the road entrance. We worked in a factory in the area which was taken over and were fortunate enough to have an open air swimming pool in the grounds. We were not issued with German money as were not allowed to go out in the town so didn’t need it, whereas in France we were paid in francs to spend in Paris. The only time we went to Minden was after VJ-Day when we had a service of thanksgiving for victory in the local church. There were no German people on the streets to watch this. I flew home to attend an investiture at Buckingham Palace on 26 June 1945 in a Dakota aircraft from a tiny airfield called Buckeberg and was given a week’s leave. King George VI asked me how long I had been in France then pinned the medal on my Wren’s jacket and then I was free to continue my week’s leave. On VJ-Day the navy ordered “splice the main brace” and we were all given a tot of rum in our enamel mugs, with disastrous effects on some of the Wrens. I was given my discharge in December 1945 and went home by train and boat, a long miserable journey, to be at home for Christmas 1945, but because I was owed so much leave, I wasn’t actually discharged until February 1946. ‘The first Wrens leave for France,’ August 1944.